Post a comment — Trackback URI RSS 2.0 feed for these comments This entry (permalink) was posted on Thursday, August 27, 2009, at 3:23 pm by Karen. Filed in Uncategorized. This one is very “Wayne Thiebaud”! Love it! Just want you to know this is my mother. 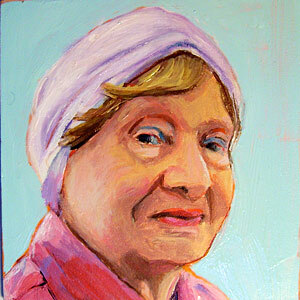 She passed away recently after a 4 year bout with cancer (Nov 2011) so I will cherish viewing this painting.